Fan created sites, pictures and anything they want to share! Fan created Glory myspace page! Click picture to go there now! So Happy wanted to share!!!!! So this was something new that I found on the site I use.......Stats!!!!! We have our good days and our bad days but these are new people (unique visitors) that have viewed the site each day! No repeats so we are getting the Glory word out! Proud fan site owner I am! Thank you to all of you that view my site! 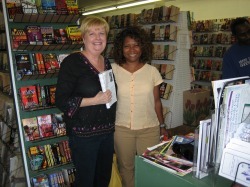 This is Lakshi McRae with Gerry at the Paperback Swap N Shop in Dickinson Texas on Saturday, October 3. What Gerry has in her hand is an ad for the November mass market release of REAL VAMPIRES GET LUCKY. It should finally be in WalMarts and grocery stores then. Mass Market is the small size. "I love the men in these series Its really funny and inspiring to people I just love it!" ------- Carl R.
"i loves these books...i cant wait to read the next one...i cant seem to put one down once i start reading...keep writimg them i will keep buying and reading them....." -----------------Rachel H.
"I love this series! It is one of my favorite to read sure beats twilight for me." ------------Chelsea C.
"I love love these books they are so good, great story telling i hope there will be a lot more of the series I love Glory. I shared the first set i had and did not get them back so I just ordered the whole series again. can not wait for the next one I have already preordered it. thanks for bringing Glory into the our lives ." ------------------Marion E.
"I cannot get enough of these books. I got a woman from work reading these books, too. Glory would be a fun person to know even if she is a vampire!-----------------------Ellen C.
"I am really hooked on this series it was such an easy read and sooo very enjoyable Glory is my idol..the guys are hot..Valdez is soo funny and the concept of a talking dog was too funny to me lol I cant wait to see what happens next I really don't want the series to end and I have my fingers cross to see this series come to life on one of my favorite networks. Gerry posted this in the Real Vampires Fan group on Facebook. 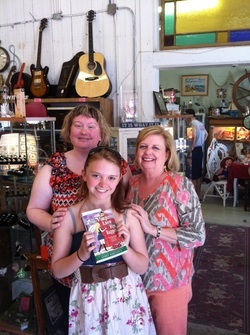 Thats her and some fans that visited her shop in Galveston. Hi! I'm Cordia Perez and obviously a fan of real vampires and the rest of the series. I'm from the Philippines. I just really want to submit a picture of Glory in 3D. 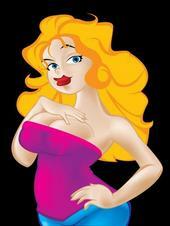 I used SecondLife (SL) to make a 3D Avatar of our Miss Gloriana St. Claire here. Thank you so much for sharing Cordia!